Police sealed off parts of the district after a worker found the device on Wednesday morning, with 4,000 people evacuated and ferry services across Victoria Harbour suspended as bomb disposal experts worked through the night. Hong Kong, China: A wartime bomb was defused in Hong Kong on Thursday after forcing a busy commercial district into lockdown, with roads closed and thousands evacuated from surrounding shops, hotels and offices. 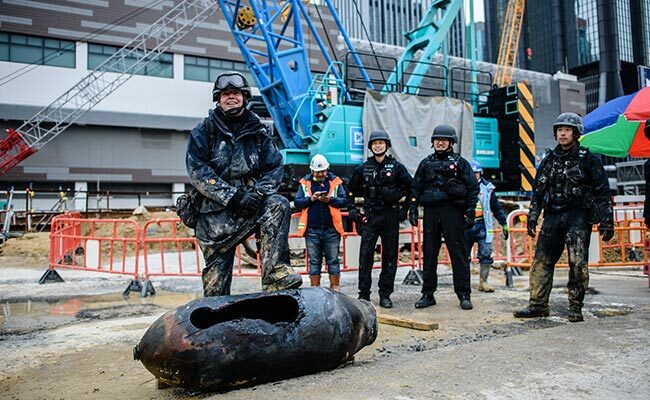 It was the second time within a week that an American bomb dropped during WWII had been discovered at a harbourfront construction site in Wan Chai. "Bomb disposal operations are dirty, difficult and dangerous. In this particular case, all three were true," bomb disposal officer Alick McWhirter told reporters. The rain, tricky location and a fuse mechanism that the team "couldn't even see" all added to the challenge, McWhirter said. The experts cut a large hole through the shell to burn off explosive materials inside before a crane lifted the earth-covered bomb off the site on Thursday. Unexploded wartime bombs or grenades are frequently found by hikers and construction workers in the southern Chinese city, which was the scene of fierce fighting between Japanese and British allied forces in 1941.